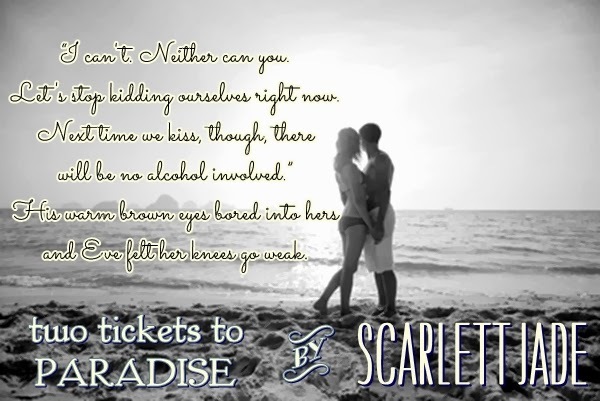 Bookends: Two Tickets To Paradise (by Scarlett Jade) RELEASE WEEKEND BLITZ!!! 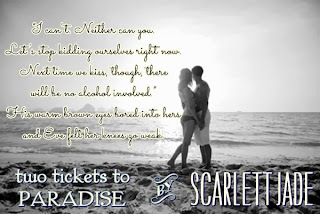 Two Tickets To Paradise (by Scarlett Jade) RELEASE WEEKEND BLITZ!!! 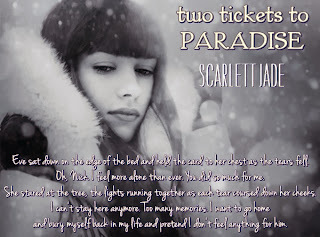 "Eve sat down on the edge of the bed and held the card to her chest as the tears fell. Oh, Nick, I feel more alone than ever. You did so much for me. She stared at the tree, the lights running together as each tear coursed down her cheeks. I can't stay here anymore. Too many memories I want to go home and bury myself back in my life and pretend I don't feel anything for him." "Oh, and Eve? I think I'm in love with you"
"I can't. Neither can you. Let's stop kidding ourselves right now. Next time we kiss, though, there will be no alcohol involved" His warm brown eyes bored into hers and Eve felt her knees go weak.